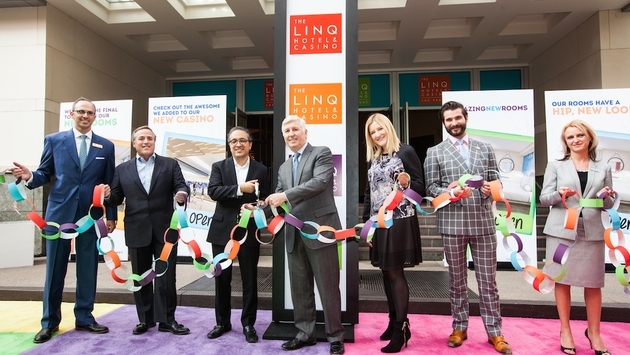 The LINQ Hotel & Casino – the latest addition to Caesars Entertainment’s portfolio of iconic Las Vegas resorts – opened its doors to the first hotel guests and celebrated the milestone with a celebratory ribbon-cutting. All hotel rooms and suites contain an interactive system on the television which gives guests access to hotel amenities. 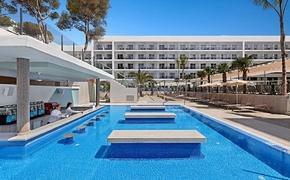 With the click on the TV remote, guests can order room service, housekeeping items, set up an alarm clock, as well as order one of the many popular board games available to be delivered to the room. Room service from multiple dining outlets at The LINQ Hotel & Casino and Promenade such as Brooklyn Bowl and Guy Fieri’s Vegas Kitchen & Bar will also be available. Guests can also access the interactive system from their personal smart phones and personalize their music experience with customized LINQ Hotel playlists on Spotify. The 600-square-foot King Suite features all of the space of a Deluxe King room, plus a separate living area. This suite offers one king bed with a pillow-top mattress. Electronic features include charging stations with USB ports and two LED flat-screen TVs – a 55-inch TV in the living room and a 47-inch TV in the bedroom. The 693/701-square-foot Suite features all of the space of a Deluxe room, plus a separate living area. This suite offers one king or two queen beds with a pillow-top mattress. Electronic features include charging stations with USB ports and two LED flat-screen TVs – a 55-inch TV in the living room and a 47-inch TV in the bedroom. The Mini Suite features all of the amenities of a standard room, plus a bit more space. This suite ranges from 300-350 square feet and offers one king or two queen beds with pillow-top mattresses. Electronic features include charging stations with USB ports and one 47-inch LED flat-screen TV. All suites are designed with light, modern furnishings with pops of color while the bathrooms feature Gilchrist & Soames bath products, a rain shower and a vanity with a make-up mirror. To elevate the comfort levels, each suite comes with microfiber robes and slippers. 3535 at The LINQ Hotel & Casino is Las Vegas’ newest infusion bar, with 35 custom made infusions used to make the most authentic and unique cocktails on the Strip. 3535 is all about experimentation and discovery, empowering guests with the opportunity to sample never-before-tasted flavors, select different sizes, order cocktail flights, and even customize their bottle service experience. In addition to the 35 infusions, 3535 will feature six wines on tap, which will be available in two different sized pours, as well as an array of champagne selections. The nucleus of the space is a visually stunning mini vortex, featuring mood-changing LED lights, in which a colorful array of the house-made infusions will be displayed against. The LINQ Hotel & Casino will be the social hub for trend-setters and partiers alike and guests can be amongst the first to stay at the newest destination resort with an exclusive introductory package, starting at $79. Book now until December 12, 2014 for hotel stays starting October 30, 2014 to January 29, 2015 at Las Vegas’ new iconic hub, designed for the socially motivated traveler with cutting-edge technology, modern furnishings and close access to The LINQ Promenade – the newest outdoor dining, retail and entertainment district which offers 12 restaurants, 14 retail shops, eight bars and two concert venue and anchored by the High Roller. The LINQ Hotel & Casino offers all guests the ease and convenience of self-check-in for a quick and speedy registration or advanced online check-in for those who want to proceed immediately to their rooms. A VIP lounge and concierge desk is available with touchscreen capabilities for immediate bookings of favorite dining and entertainment offerings. Combined with The LINQ Promenade and the High Roller, recently named by Travel & Leisure as the “World’s Coolest New Tourist Attraction,” The LINQ Hotel & Casino is set to become the new social center of Las Vegas. Guests can now book reservations online at www.TheLINQ.com or by calling 855-891-6863.